Stop By Our Booth #432! When you visit us at a conference, you’re guaranteed to learn something new. We have a ton of fun planned. Stop by our booth to get free goodies, take fun photos with our funny engineering props, meet members of the EiE team, and learn about our newest offerings Wee Engineer and EiE for Kindergarten. How can you capitalize upon children’s proclivities to build things and explore how they work to develop children’s ideas about engineering? In this session, we examine what age-appropriate engineering looks like for very young children. Participants will engage in activities to construct an understanding of what “technology” and “engineering” are. Then we will watch short video clips of preschool and kindergarten children engaged in engineering activities and identify general principles important for engineering with early learners. Participants will come away with an appreciation of how engineering can foster children’s creative thinking and persistence and an engineering activity to try with young learners. 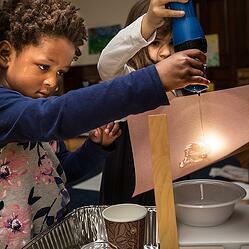 Looking to learn more about how and why to introduce engineering to young learners? 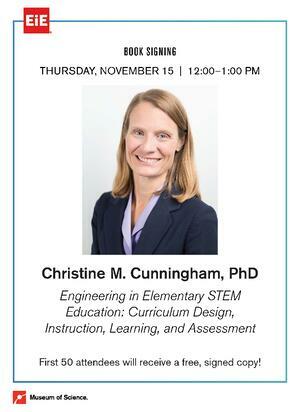 EiE Founding Director Dr. Christine Cunningham, will be signing copies of her recently published book, Engineering in Elementary STEM Education: Curriculum Design, Instruction, Learning, and Assessment. Starting at 12 PM in our booth, we’ll be giving away 50 free copies of Engineering in Elementary STEM Education on a first-come, first-served basis. Not attending NAEYC? You don’t have to miss out on all the fun. Take this fun quiz and get a free poster!